Heat oven to 400°F. Spray 18x13x1-inch sheet pan with cooking spray. Cook and drain macaroni as directed on package. While macaroni is cooking, melt 1/2 cup butter in 5-quart Dutch oven over medium heat. Stir in flour, salt, pepper and red pepper. Cook over medium heat, stirring constantly, until mixture is smooth and bubbly, then cook 1 minute longer. Stir in mustard and Worcestershire sauce. Stir in milk. Heat to boiling, stirring frequently. Boil and stir 1 minute. Remove from heat; stir in cheese until melted. Gently stir macaroni into cheese sauce. Pour into sheet pan; spread evenly. In medium bowl, mix melted butter and bread crumbs; sprinkle evenly over pasta mixture. Bake 32 to 36 minutes or until sauce is absorbed and bread crumb mixture is golden brown and crispy. 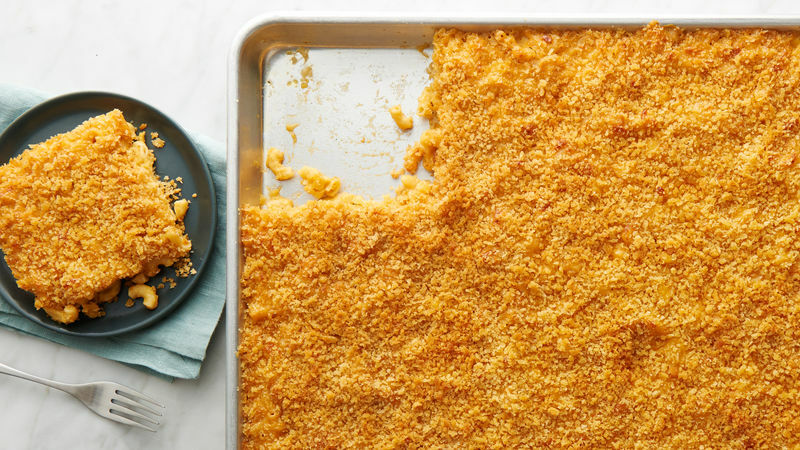 Dijon, Worcestershire, cayenne and sharp Cheddar add a little extra flavor to this classic mac. Baking at a high temp (400°F) ensures golden brown crispy bread crumbs. Cooking the flour in the butter for at least 1 minute after the mixture bubbles gets rid of the chalky flavor of raw flour so you don't end up with a pasty sauce.